On 16th April many of us made our way to Launceston College to attend our Annual General Meeting, to listen to two special speakers, to catch up with old friends and generally have a Good Day! Having welcomed us all to what was her last A.G.M. as Chairman, Susan sailed through the usual necessities – Apologies, Minutes from 2010, and matters arising and on to the Treasurer’s Report. Then we learned that Linda Baldrey would be unable to take the post of Chairman, and that Jenny Crossland would be the new Chairman. Steph took us on a journey through her quilting work, showing many examples, adding her own wry comments, and telling of the inspiration and ideas behind each article. What I noted and admired in most of the pieces displayed were the backgrounds of the pictorial quilts, which were totally pieced and were used to give support and movement to the quilts. As I listened and looked, I felt that through Steph’s confident delivery, her explanations and exhibits I had learned a lot about the person I thought I had known. It was great! 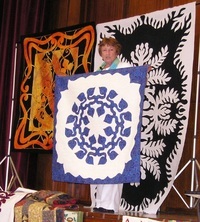 Most of us are familiar with Maggie’s work especially in Hawaiian Quilting and Applique, and her delightful pieces using the Hot Ribbon technique. For an hour Maggie had swept us along through her needleworking career, and it was inspiring. 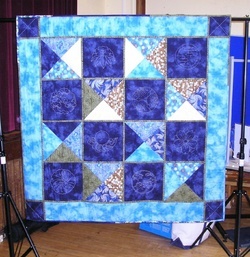 As she put it – we’d been seeing one person’s work, or “20 years of handwork”!